A new Kickstarter project aims to disrupt the pill case market. True, it’s not the sexiest industry in the world, but it’s ripe for some disruption, since there just so happens to be a huge market for it and there’s very little, if any, differentiation between current competitors. 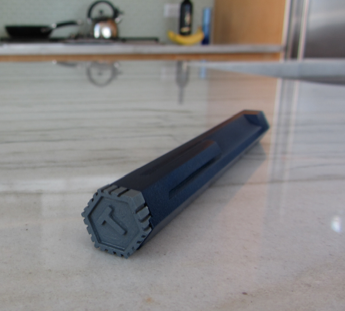 Well, in a few words, it’s a pill case that’s shaped like a pen, fittingly named the CapsulePen. Essentially, the product is just a tube of plastic (a bit wider than a pen) that can hold up to seven large pills. The caps of the case are marked with a letter, to display which day these pills are meant to be taken on, and they’re also magnetized. This means you can post up your CapsulePen on the fridge or lock them all together on the kitchen table or in a suitcase for a trip. The brilliance of it is simple. We carry pens around with us already, whether it be in a dedicated pen slot in our bag or in our pockets or even in that sweet spot between your ear and your head (though I don’t think that example applies to the CapsulePen unless you’re really ready to make a statement). It also extends past the core pill case demographic, who happen to be on a serious regiment of various medications on a daily basis. By that, I mean, popping half a bottle of Advil into the CapsulePen and throwing it in my bag would be much more space-efficient, comfortable, and user-friendly than bringing the whole bottle into work with me. Joe Cote, the brains behind the operation, is asking for a grand total of $15,000 over the next 52 days. Pledges start at $15, so if you think this is worth your while, head on over to his Kickstarter page and show your support.